I finally finished them. 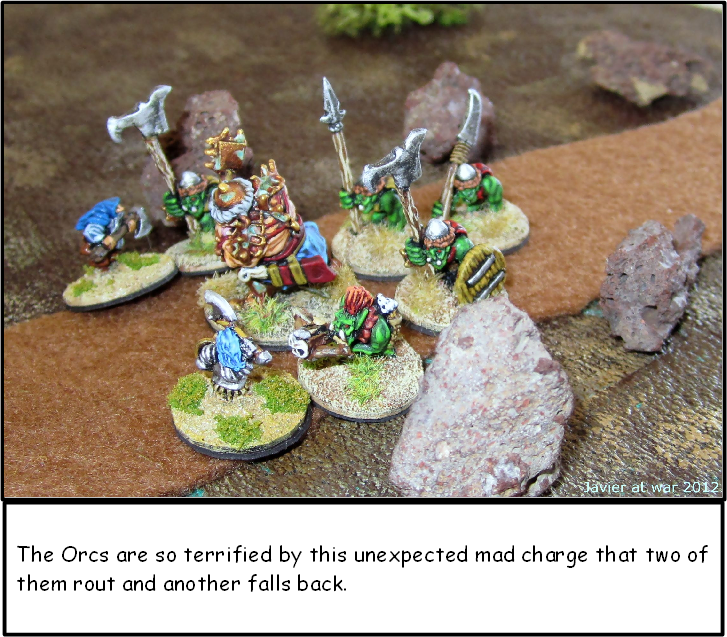 I painted them in several stages, being the first ones in the early nineties and the last ones with painted shoulder pads this week. 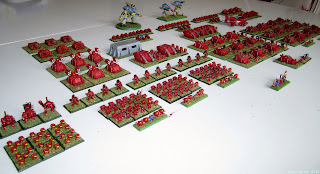 I have also painted four stands of Legion of the Damned Marines to form a detachment. They will come in help of my marines in dangerous moments. I am not happy how they turned out but anyway, they are painted and ready to game. Last Sunday I was painting Epic stuff and I put to dry in the third story balcony the last Termies I dipped to finish the company. When I went to pick them I looked everywhere but I could not find them, then I leaned out of the balcony and saw the stick to where I glued them on the sidewalk; the wind had blown them out of the balcony . I thought "there they are, I'm coming down right now to fetch them before something else happens to them", and in that very moment a car coming out from the garage run over them. 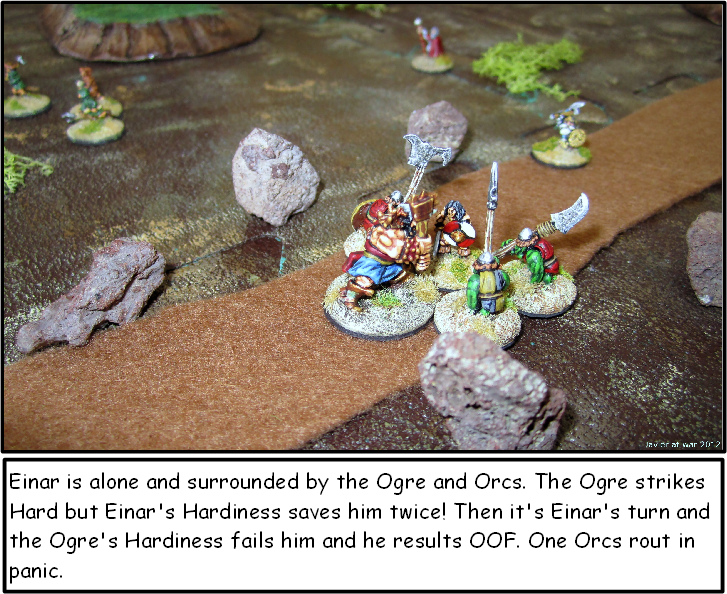 Aieeeeeeeeeee, my termies! When I got the stick no Termies were still glued to it, so I searched and searched for almost fifteen minutes until I found five of six and then gave up and return to painting. In the end I could recover three of them as one was MIA, another with the legs broken and the last one totally squashed as he failed all his save rolls, LOL! Thank God I have two spare termies to finish this last one stand; so if nothing else happens, I'll post pictures of the full Terminator company at the end of the week. Lesson learned: do not put to dry outside light weight plastic soldiers on a windy day. Tired of painting only in red, I took a break to paint some badly needed air support for my Blood Angels Epic Army. Here is the "Devlan Mud ate all details" squadron. 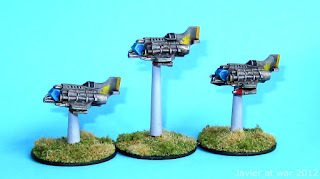 There are one more Thunderbolt and one Marauder squadrons in the painting queue, but I will paint them later on as first I want to finish my Terminator company. 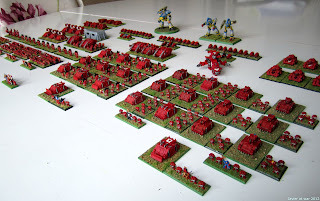 Recently me and my friend Paco have felt that bug again and after many years of oblivion, since the days of Epic Space Marines second edition, we have dusted off our armies again and started to complete unfinished companies of our Epic armies. Here you can see what I have finished so far of my Blood Angels Epic Space Marine for Net Epic. ...1 Bike company with Chaplain and Librarian, 1 Reaver Titan, 2 Warhound Titans, 1 Tactical company with Chaplain and Librarian and 1 Razorback detachment, 1 Thunderhawk gunship and 2 Predator detachments. To be painted and finished: 1 Terminator company, 1 Veteran tactical company, 2 Mole mortars detachments, 2 Thudd guns detachments, 1 Legion of the Damned detachment, 2 Land Speeder detachments, 1 Attack bikes detachment, 1 Dreadnought detachment, 2 Reaver titans, 1 Warlord titan, 1 Imperator titan and loads of Rhinos. After that a small Imperial Guard army with two infantry companies, 2 heavy tank companies, several artillery and fighter and bomber detachments and 1 Capitolis Imperialis. I hope to play soon NetEpic and Epic Armageddon! 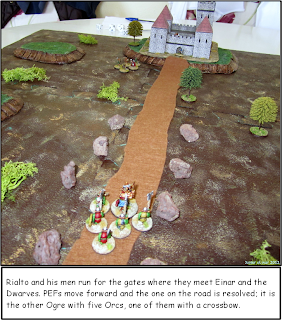 Einar's saga. The end of the way. 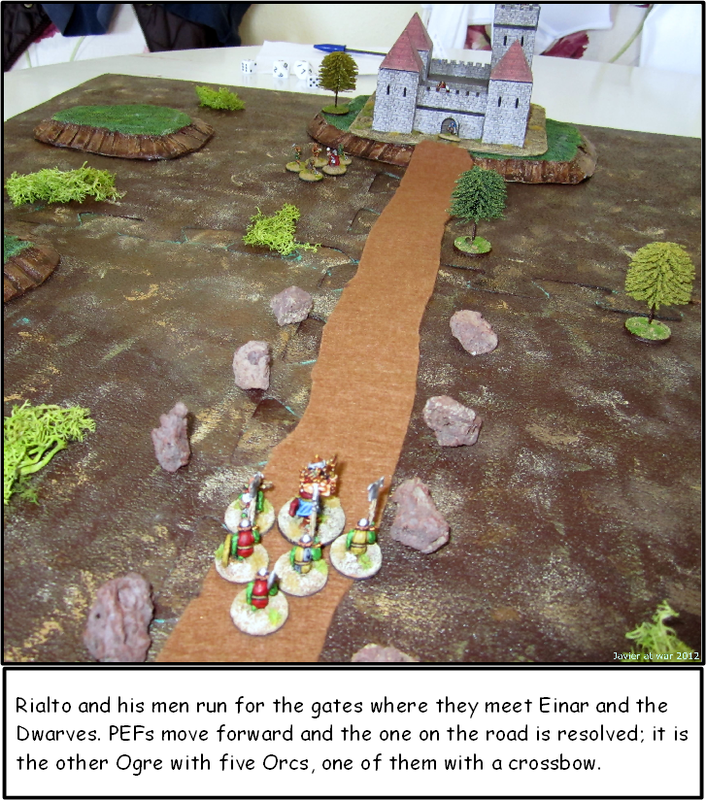 After fleeing from the dungeon where Fafnir lost his life, and escaping from a several days pursuit by the Orcs, Einar and his friends reached the frontier of the Border Kingdoms. 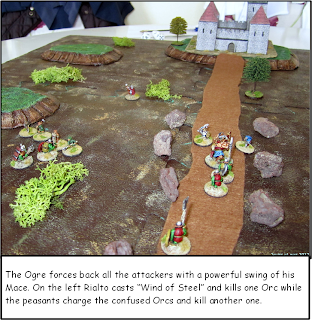 From there they travelled to the heart of the country, avoiding enemy patrols, healing, and looking to fulfill Einar's prophecy, foretold by a witch in Mirholme more than a year ago; that he will become king when he got the sword of power and taken with it a castle by the force of his arm. It was November of 897 when they finally spot a small castle on a hill. 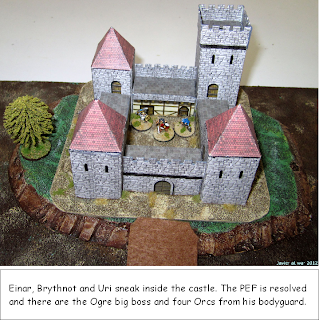 The castle was dissapointingly small, but Einar's barbarian sense of humour quickly overcame it; at least it was bigger than his father's meadhall, and made it in solid stone! 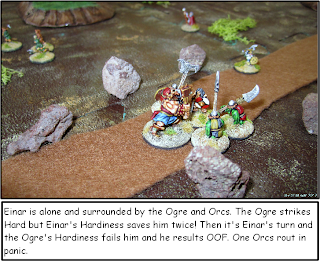 The castle was infested by Orcs, so Einar and his men hid in a wood and from there spied Orc's movement. 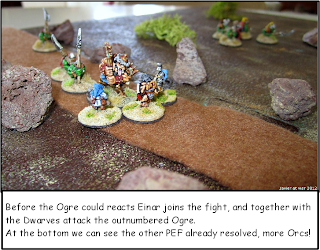 Half of the day had already passed when Einar accidentally met some local peasants who were hiding from the marauding Orcs. They told him they were servants of the lord of the castle who had been slaughtered together with his family and most of the inhabitants of the castle, by a large party of Orcs commanded by two monstrous Ogres. Nobody has survived but them. 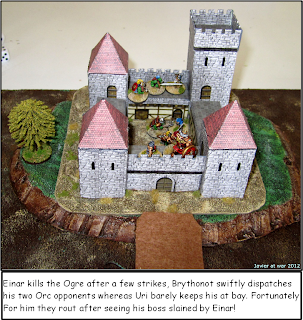 Then Einar told them his intention to kill all the Orcs and retake the castle for himself, and seeing his noble and bold appearance, they promised to swore serfdom to him as the new king if he fulfilled such heroic deed. Then they told him about a secret passage that could lead them inside the castle and offered to go with them. 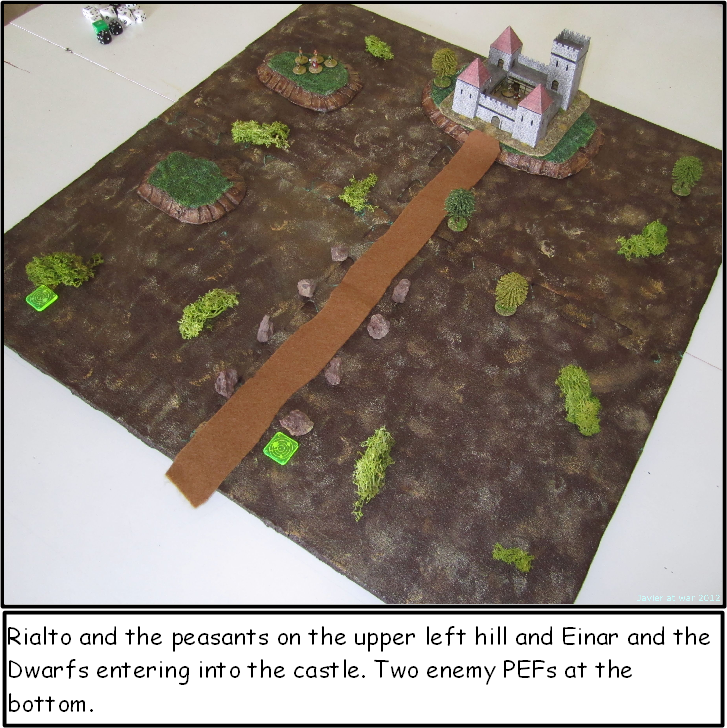 The game starts with Einar and the Dwarfs Brythnot and Uri entering into the castle, while Rialto with some peasants come out from a nearby hill an run for the gates to secure them. 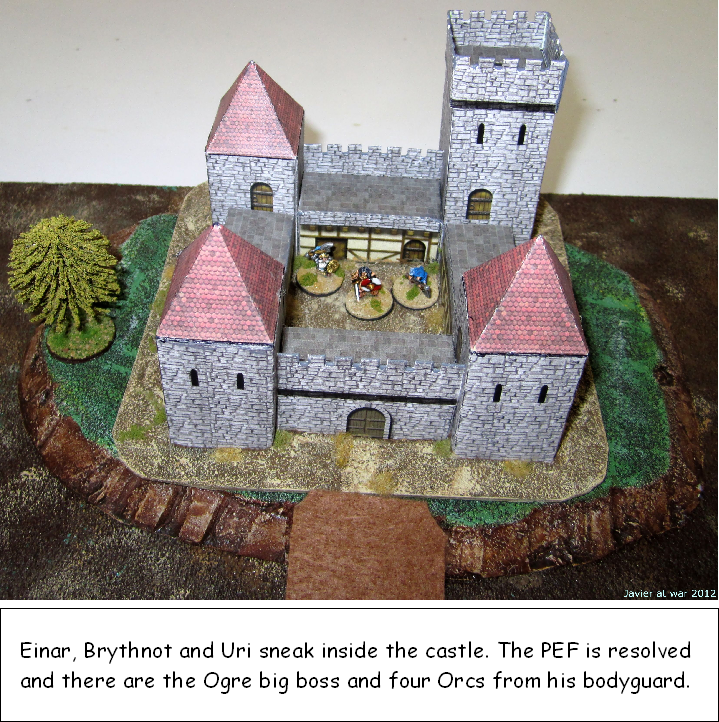 One enemy PEF is deployed inside the castle and is revealed as soon as Einar gets in; the other two are deployed outside the castle at random. After the fight I rolled for possible Rep and Hardiness advances: Einar raised his Hardiness to four but Rialto downed to 2. 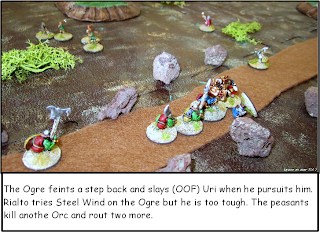 Uri recovered from the Out of Fight but with a minus 1 to his Rep.
Well, this is it. The end of the campaign, a successful end because Einar got his sword and his castle and now he is king, but also and more importantly, because I had hours and hours of fun. 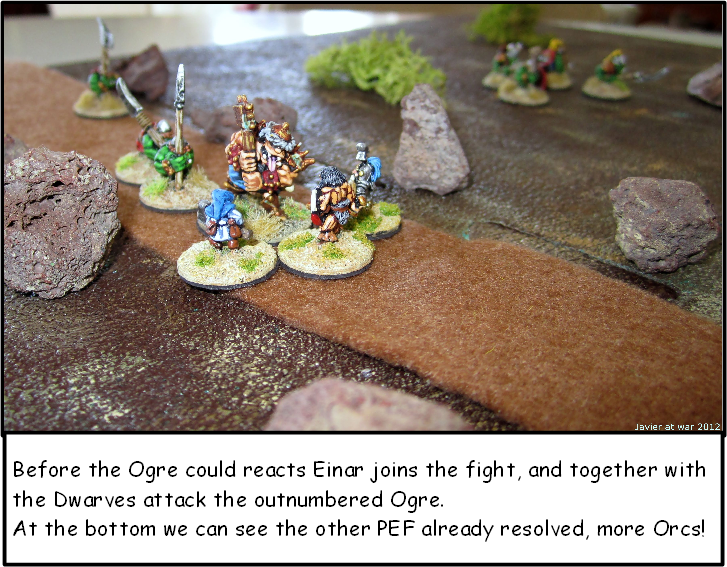 The campaign started more than one year ago and it has lasted more than a year in the Einar's world as well. 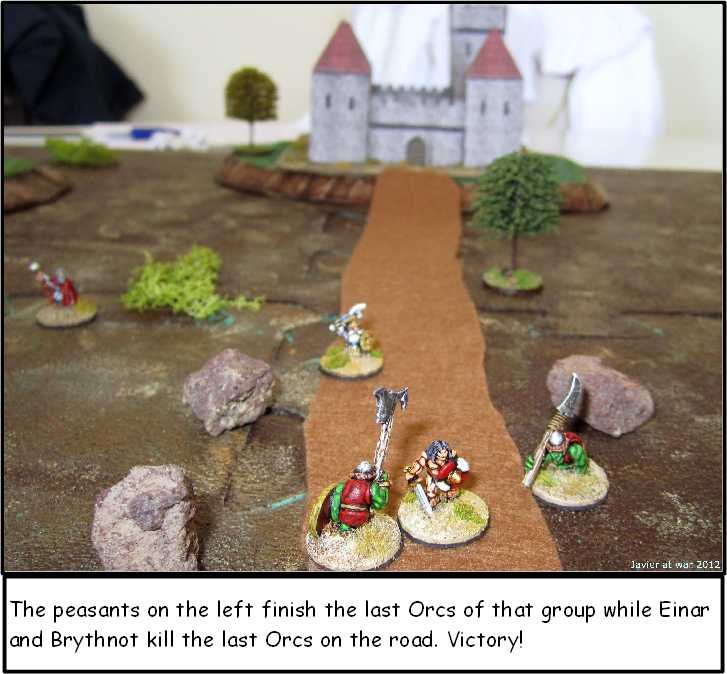 Einar lost dear friends but gained new ones, he met all kind of creatures and monsters, travelled great part of Talomir, made raids, rescued people and explored dungeons. 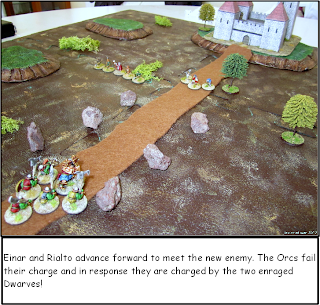 All this exciting high adventure thanks to Warrior Heroes Armies and Adventurers ruleset from Two Hour Wargames, the best fantasy skirmish ruleset out there IMHO. Now I will sat and patiently wait for the second release of WHAA with the new mechanics from CRFV and new adventures in the world of Talomir! 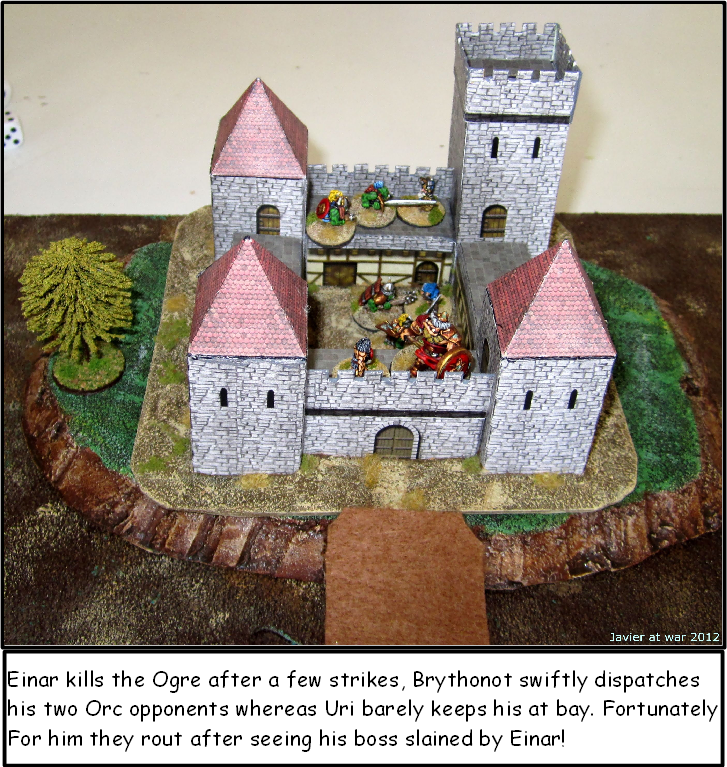 In the meantime, Einar will send word to his father to move all his people from the North to the Border Kingdoms, and from his castle to conquer the land of the Orcs and found a new kingdom...but that's is a another story.